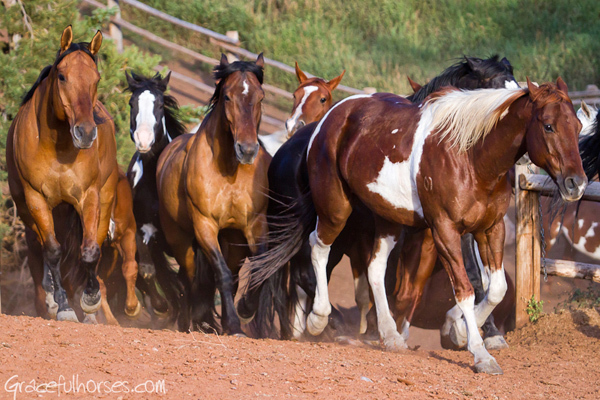 Manuela Stefan of Graceful Horses visits an authentic Jackson Hole dude ranch to photograph and experience beautiful horses and iconic Western scenery. 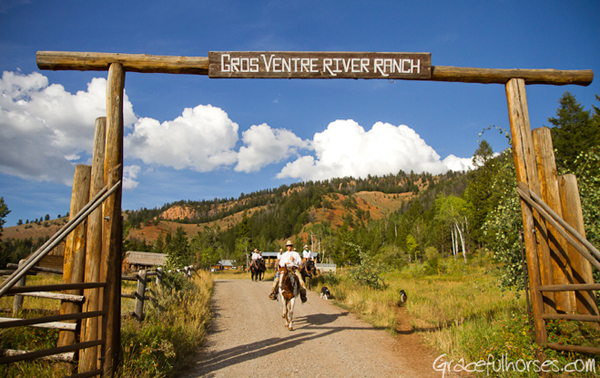 While exploring the area around Jackson, Wyoming and exhibiting my equine art at the Western Design Conference in town, I had the privilege to live in a place that is hard to even begin describing–– the Gros Ventre River Ranch. Gros Ventre River Ranch wranglers going for a ride. 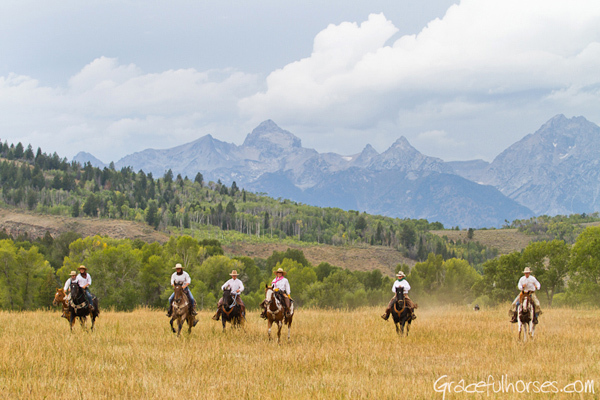 The Gros Ventre River Ranch pasture offers spectacular views over the Grand Teton mountain range. Remotely located in the Teton National Forrest with the Gros Ventre River running right through its grounds, the ranch offers spectacular views over the Grand Teton mountains. I vividly recall the scenic drive from Jackson, during which I always seemed to have a hard time focusing on the wheel as I was constantly in awe of what was unfolding around me–– breathtaking landscape and abundant wildlife. 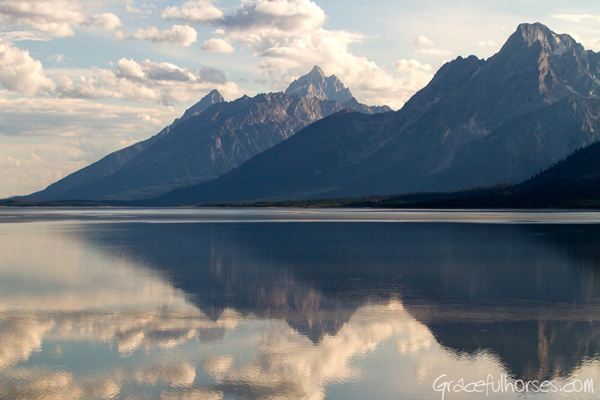 The Grand Teton and Yellowstone National Parks are easily accessible from the Gros Ventre River Ranch. 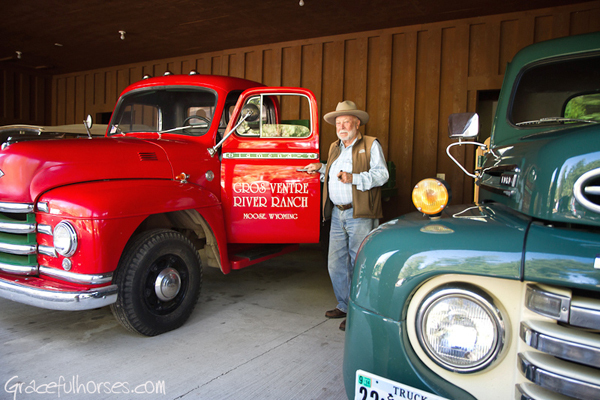 Owner Karl Weber’s collection of classic trucks is a familiar sight at the ranch. Amazing owners and managers, dedicated and passionate wranglers, talented cooks and of course, last but not least, some of the most beautiful horses I have seen, all come together and co-create an energy which wraps around everyone who steps into the ranch. Well taken care of and loved, the GV horses invite guests on great riding adventures, revealing superb trails and unbelievable views to those who choose to hop on their welcoming backs. Manager Sean McGough and horse Hootchie. 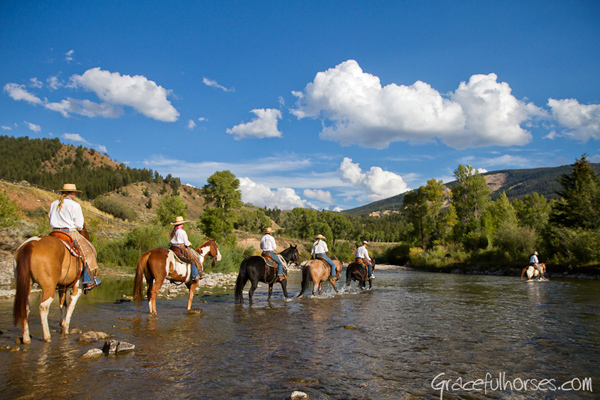 Wranglers crossing the Gros Ventre River. 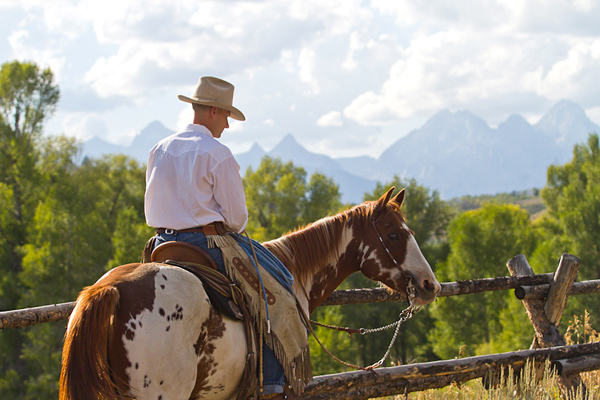 In 1987, current owners Karl and Tina Weber purchased the property which had been previously operated as a dude ranch for 30 years. They have done an incredible job enhancing it step by step. Back in the 50’s, rustic log cabins were moved here from the second oldest dude ranch in Jackson, the Bar BC, and still serve as cozy accommodations for guests. The Webers increased the size of the ranch from four cabins to eight, added a main lodge overlooking the Gros Ventre River, as well as a beautiful barn and horse facility. 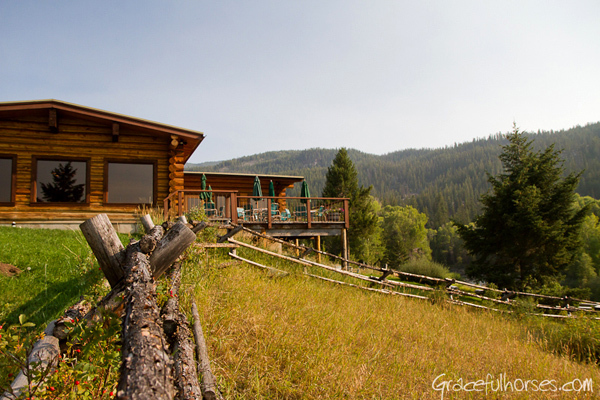 The main lodge at Gros Ventre River Ranch. 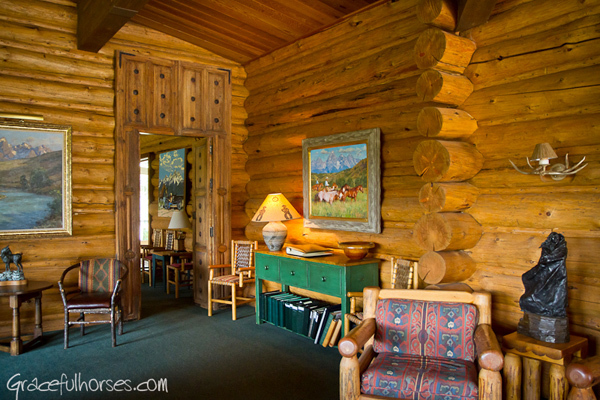 Original western art, sculpture and furniture, the main lodge sits on the banks of the Gros Ventre River. 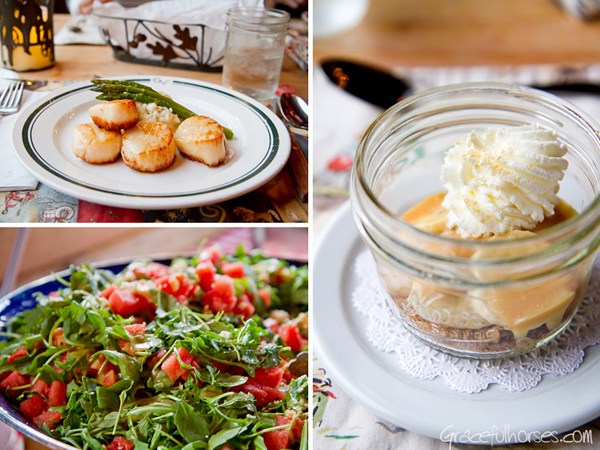 Gourmet meals are prepared daily by the ranch’s talented chefs. Today, the ranch is managed by the couple’s daughter Tori and her husband, Sean McGough. I want to thank the Weber and McGough families for their amazing hospitality and for their sustained efforts to offer an authentic, unforgettable experience to those who step through their door. I very much look forward to visiting again! Gros Ventre River Ranch’s beautiful horses coming in for supper. How you can go: Learn more about this authentic Jackson Hole dude ranch with horseback riding in the Gros Ventre Wilderness, Teton National Forest and Bridger Teton Park, private fly fishing, hiking and more on the Gros Ventre River Ranch website and on their page in the Equitrekking Vacation Guide, an online guidebook dedicated to great dude ranches, guest ranches, cattle drives and horseback riding vacations.